Dreams can turn devilish and disrupt our lives in subtle ways. 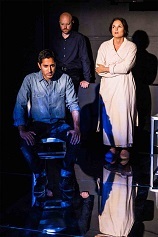 In Ken Urban’s “The Awake,” directed by Adam Fitzgerald, at 59E59 Theaters through September 8th, dreams seem to randomly echo our worst fears. Despite its noirish atmosphere of mystery and dread, “The Awake” remains nightmare-lite. In other words, to say it is noir-ish is to say it’s more gray than black. “The Awake” is very entertaining, never more so than when Gabrielle (Lori Prince) brings her vaguely Balkan inflected narrative to startling conclusions. “I am actress, Gabrielle, yes,” she says, while her husband Richard (Jeff Biehl, in a variety of roles) explains away her accent by saying she watches too many foreign films. Gabrielle’s bright red dress, like her animated delivery brighten the gloom of “The Awake,” with its diverse population of haunted characters. Malcolm (Andy Phelan) doesn’t accept that his mother’s (Dee Nelson, also in the ensemble of roles) comma is permanent and fatal. Richard and his daughter Celeste (Jocelyn Kuritsky, who takes on a number of parts) seem to go in for devising instruments of torture. 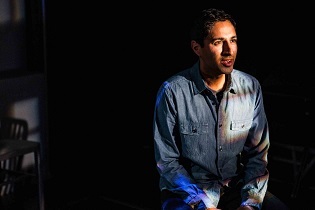 Nate (Maulik Pancholy) is a fugitive from Homeland Security. “The Awake” achieves what seems impossible at first, tying all its loose ends to one central locus. It begins with the individual night terrors of its main characters, Nate, Gabrielle, and Malcolm, and their significant and insignificant others, but pulls it altogether at the end. Not that it makes a great deal of sense in the linear traditions of a plot, but it brings its own dream-like denoument. 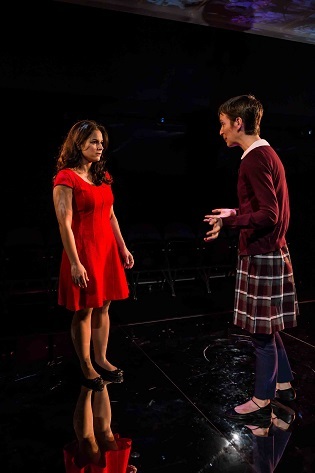 Lori Prince and Jocelyn Kuritsky in Ken Urban’s “The Awake” at 59E59 Theaters. For more information about Ken Urban’s “The Awake,” go to his site from here. For tickets for this production, go to www.59e59.org. Adult Acting Classes at Bare Bones Theater in Northport, NY: Register by September 9th. Bare Bones Theater Company has trained adults in acting since 2000. There are openings in the four classes offered this fall: two classes in Fundamentals of Acting; one class in Intermediate; and one class in Improv. Each class meets one evening per week for ten sessions, starting the week of September 23, 2013. Registration for all four classes will be held the week of September 9. Registration is by appointment only. Registration and all classes will be held at Bare Bones Theater, 57 Main Street, Northport, NY. For details about the schedule and the online registration form, click on the links below. Call 631-606-0026 or e-mail info@barebonestheater.com with any questions. Theater Accident, in association with Blue Coyote Theater Group, are thrilled to present the world premiere of WHY WE LEFT BROOKLYN, written by Matthew Freeman and directed by Kyle Ancowitz. WHY WE LEFT BROOKLYN begins performances on August 29th for a limited engagement through September 21st. Performances are at the Fourth Street Theater (83 East 4th Street, between Bowery & Second Avenue). Tickets are $25. To purchase tickets, call SmartTix on 212-868-4444 or visit www.smarttix.com. For more information, visit www.theateraccident.com. “notes to MariAnne”, a free staged reading of a new musical written by David Rossmer and Dan Lipton, directed by Leigh Silverman, presented by Amas Musical Theatre as part of the Amas Musical Theatre Lab Series, on Thursday, September 12th at 1pm and 4:30pm at The Steve and Marie Sgouros Theatre, 115 MacDougal StreetTh. “Sweet Smell of Success”, presented by NYU Steinhardt’s Program in Vocal Performance, will run from September 12th to 14th, and features music by Tony, Oscar, Emmy, Grammy, and Pulitzer Prize winner Marvin Hamlisch, lyrics by three-time Tony Award nominee Craig Carnelia, and book by Tony Award winner John Guare. Steinhardt’s own John Simpkins directs. Performances are at NYU Skirball Center for the Performing Arts, located at 566 LaGuardia Place. Tickets are $30 general admission, with student and senior discounts available. The September 12th performance will begin with the posthumous induction of Marvin Hamlisch into NYU’s Musical Theater Hall of Fame. For tickets, contact NYU Ticket Central at nyuskirball.org/calendar/sweetsmell, 212.352.3101, or in person at 566 LaGuardia Place (at Washington Square South). At the time of the Japan earthquake in March 2011, the New York City-based playwright Chiori Miyagawa, whose family was affected by the disaster, saw a photo of an evacuation center wall, covered with handmade messages seeking contact with missing family members and friends. This image moved her, and she began thinking about the concept of reunion, especially following a natural disaster or war. That summer, setting out to create play on the topic, Miyagawa and the director Alice Reagan began holding salons in which artists and others shared their own reunion stories. The results were extraordinary: participants dug deep into their personal histories to tell stories that were intimate, heartbreaking and inspiring. Based on these meetings and on additional research, Miyagawa wrote I Came to Look for You on Tuesday, which makes its world premiere, directed by Reagan, September 26th to October 13th at La MaMa’s First Floor Theater (74A East 4th Street). Days and times of performances will be announced soon. As of mid-August, tickets, which are $18, will be available at www.lamama.org and212.475.7710, and in person at La MaMa’s main box office (74A East 4th Street). Where is the line between stubborn and principled? 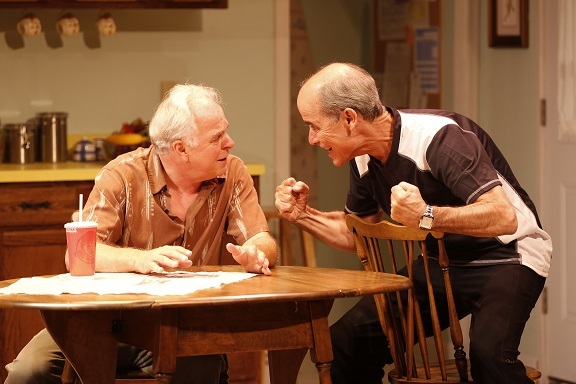 Robert Emmet Lunney as Buzz Adams and PJ Benjamin as Ray Deluso in “I Forgive You, Ronald Reagan,” by John S. Anastasi at the Beckett through Aug 25. Photo by Carol Rosegg. 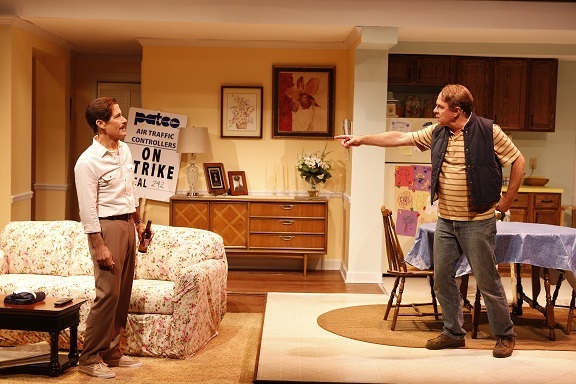 The major thread in “I Forgive You, Ronald Reagan,” at the Beckett Theatre through August 25th, is about staying the course. Reagan famously, after issuing a warning, did not back down and the air traffic controllers who remained on strike lost their jobs. He showed the world that he was not a waffler, and on August 5, 1981, 11,345 PATCO employees were fired. 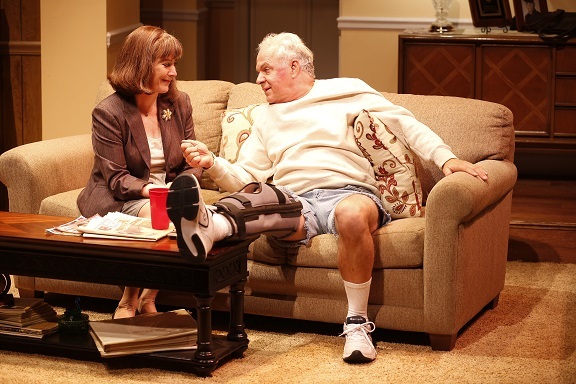 Patricia Richardson as Jane and PJ Benjamin as Ray in “I Forgive You, Ronald Reagan.” Photo by Carol Rosegg. Both sides based their actions and decisions on principles. Against this backdrop of history, John S. Anastasi has written an intelligent family theatrical piece. Ray Deluso (PJ Benjamin) believed that PATCO would prevail if everyone held fast. His choice to not return to work proved to be life altering. Not only did he lose a job he loved, but he apparently also lost his mind. His wife, Jane (Patricia Richardson) paid a hefty price, as well, of course, and there is plenty of tension in their household. Twenty-three years later, Ray has mostly recovered from his depression, but he still has not forgiven his best friend, Buzz Adams (Robert Emmet Lunney) for returning to work. PJ Benjamin as Ray with Robert Emmet Lunney as Buzz in “I Forgive You, Ronald Reagan.” Photo by Carol Rosegg. The ensemble of four is rounded out by the Deluso’s pampered daughter, Tess (Danielle Fatielson), an aspiring actress, who even at 26 is daddy’s little girl. Under Charles Abbott’s guidance in “I Forgive You, Ronald Reagan,” the cast give excellent, realistic performances. “I Forgive You, Ronald Reagan” is put together well, with the flashbacks and most of the expository scenes keeping both the drama alive and the plot moving. There is a small quibble at the ending, which holds an air of mystery at the curtain. All in all, however, “I Forgive You, Ronald Reagan” is an entertaining and engaging work, well-worthy of the talent in it, and of your attention as an audience. For more information on“I Forgive You, Ronald Reagan,” please visit The Beckett site. 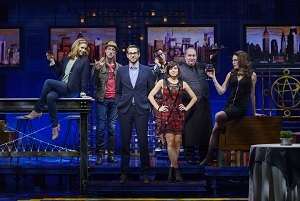 The cast of “First Date,” which opened at the Longacre on August 8, in a photo by Chris Owyoung. There is no doubt a need for “a guide to what not to do, when you meet someone new.” No, those lyrics are not in Broadway’s “First Date,” currently at the Longacre Theatre in an open run. They are mine, inspired as it were by Alan Zachary and Michael Weiner, music and lyrics, and Austin Winsberg, book, as it were. The composers and lyricists have done a nice if generic job tweaking genres with a little bit of pop, a touch of rock, a pinch of rap, and, since this is a romance, a ballad or two. 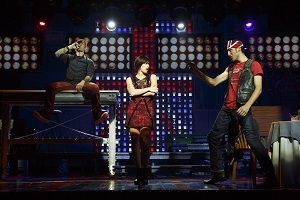 Krysta Rodriguez as Casey and Zachary Levi as Aaron. Photo by Joan Marcus. In “First Date,” by which the auteurs really mean “blind date,” Casey (Krysta Rodriguez) offers Aaron (Zachary Levi) some useful pointers on what not to do in this situation. Aaron and Casey are meant to be the opposites that attract, and we’re rooting for them. But, “First Date” is more of sketch than a full-blown musical. Even as a skit, it quickly goes from a cute parody of a blind date, to one that has overstayed its welcome. In fact, “First Date” seems to miss by thirds– it’s a third too long to be witty, and the third iteration of the “Bailout Song’ is just one too many to be funny. Wanting to learn more about “First Date,” visit www.firstdatethemusical.com. Abdur-Rahim Jackson surround Eric Anderson as Shlomo Carlebach (with guitar). Photo by Carol Rosegg. It’s such an old adage that it is often dismissed as trivial, but music does have the power to unite and soothe! In “Soul Doctor,” at Circle in the Square for what should prove a very long run, a fusion of musical styles seems to restore the “doctor” as much as it does his flock. Shlomo Carlebach (Eric Anderson), whose autobiography is inspiration for “Soul Doctor,” created by David Schechter (lyrics) and Daniel S. Wise (book, and direction) from a concept by Jeremy Chess, with additional material by Neshama Carlebach, came to be known as the “Rockstar Rabbi.” Learning about him is one of the many blessings of this musical. Stiff and bashful to begin with, Anderson’s Shlomo grows into the easy showman who goes everywhere to spread a message of love and peace. Shlomo even returns to Vienna, from which he and his family fled the Nazis when he was a boy. It’s Nina Simone (Amber Iman), who invites him to join her in the 1972 concert in the Vienna City Square. Nina seems to have had a knack of recognizing what Shlomo needed for him to find healing. 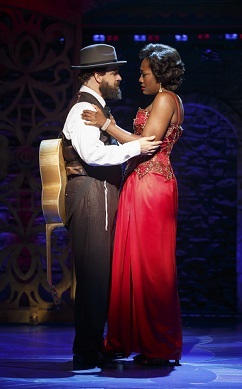 Eric Anderson as Rabbi Carlebach and Amber Iman as Nina Simone in “Soul Doctor.” Photo by Carol Rosegg. Admittedly, Nina Simone is an unusual hook for a story, but then this is an unusual tale about the unusual musical force, that was Shlomo Carlebach. Shlomo stumbled upon Nina playing in a Greenwich Village bar and they remained fast friends. She liberated his voice, and helped launch his performing and recording career. Much of the music in “Soul Doctor” is a fusion of jazz, rock, folk and the Jewish liturgical traditions and gospel, written by Shlomo Carlebach, who died in 1994 at the age of 69. The large ensemble cast anchored by Eric Anderson as Shlomo and Amber Iman as Nina are terrific. There is some very original choreography that also helps carry “Soul Doctor,” by Benoit-Swan Pouffer. Nice work all around. 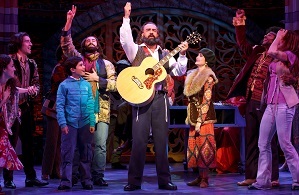 As “Soul Doctor” opens, and the cast wanders in through the auditorium and onto the stage, singing joyously, it’s tempting, if a bit glib, to say that “Hair” has met “Fiddler.” “Soul Doctor” has much of the same life-affirming spirit of those terrific musicals. And an uplifting spirit all its own, as well. 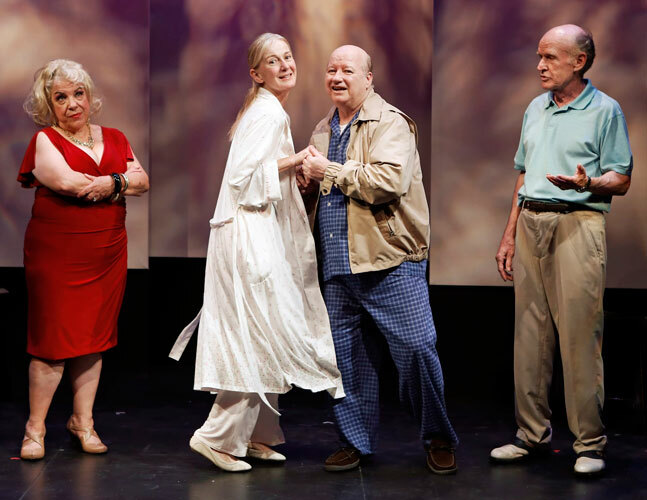 Let Us (Mostly) Praise "Summer Shorts"
Alan Zweibel’s “Pine Cone Moment” part of Summer Shorts 2013, with Cmille Saviola as Bunny, Caroline Lagerfelt as Emma, Brian Reddy as Harry, and James Murtaugh as Brian, at 59E59 Theaters through August 31. Like with tapas, you can fill up on three short plays and walk away fully satisfied. Of course, sometimes not every dish is perfectly delicious. Having one of out 3 morsels be good is not great, but 4 out of six is just fine. “Summer Shorts,” at 59E59 Theaters throough Augsut 31, celebrates the short form with 2 sets of one act plays by some of America’s top playwrights. From past seasons of this seven year old festival, expectations may vary. Will they be diamonds in the rough or little jewels of invention? Leaving the best for last, let’s get Series A out of the way first. It opens with Neil La Bute’s “Good Luck (in Farsi)” which is obvious and repetitious. This is the weak sister of the programsm about back-stabbing actresses, Paige (Elizabeth Masucci) and Kate (Gia Crovatin) vying for the same role. La Bute – who also directs this playlet– hits a satirical mark or two in the overlong short play. To be fair, La Bute has had some very successful outings with the short form at past “Summer Shorts,” but really he should have quit while he was ahead. “Good Luck (in Farsi)” is too much like a sketch and too little like a fully-developed play in miniature. Sarah (Marisa Viola) is both the narrator and a participant in the annoying sound-bite “About A Woman Named Sarah,” by Lucas Hnath. The play is about Palin’s selection interview with John (Mark Elliot Wilson) and Cindy (Stephanie Cannon) McCain. In it not even Todd (Ben Vigus) wants her to run. “Summer Shorts 2013 Series B” proves the adage that good things come in small packages.Series B features three of rhe most enjoyable short plays. These are about love and desolation, and each hits a different rhythm, and all three stride forward towards a revelation. “Change” doesn’t come easy to three college pals, Ted (Alex Manette), Jordan (Michael Dempsey), and Carla (Allison Daugherty), reuniting after 20 years. Paul Weitz’ sardonic look at the ways we grow up after graduation is bitterly funny. “Falling Short” is tender and moving. Marian Fontana’s heroine, Lee (Kendra Mylnechuk) delivers some very funny bon-mots, including her pity analysis of the writer’s plight. “It’s like having a paper due everyday of your life.” Lee’s date with the over-the-top quirky Nate (JJ Kandel) whom she met on-line is charming. Well directed by Alexander Dinelaris, the playwright of Red Dog Howls, and other works. Alan Zweibel’s “Pine Cone Moment” is a beautiful look at how to move on. The aging protagonists, Emma (Caroline Lagerfelt) and Harry (Brian Reddy) are both haunted and encouraged by their dead spouses, Bunny (Camille Saviola) and Brian (James Murtaugh). As Bunny did in life so, with her red dress and plus-size personality Camille Saviola steals the show. Also outstanding as the boyishly wide-eyed Harry is Brian Reddy in an exceptionally fine cast. The acting in all the pieces, good and bad, was very good. Besides the wonderful ensemble in “Pine Cone Moment,” the nice work in “Breaking the Spell,” and “Falling Short,”Alex Manette and Allison Daugherty in “Change” also made a great impression. The best of “Summer Shorts” are one-acts with an arc. In Series B, as a case in point, this season, there was a generously fine array of succinct dramas with finely developed characters and fleshed out plots. Hold on tight. Family can elicit many feelings– not all of them Norman Rockwell images. 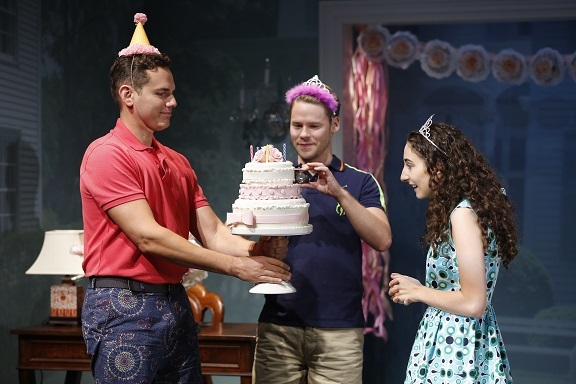 Paul Anthony Stewart as Ted, Randy Harrison as Kevin and Alexis Molnar as Lottie celebrate Lottie’s birthday in Chad Beguelin’s “Harbor,” under the direction of Mark Lamos at Primary Stages at 59E59 Theaters through September 8th. Photo by Carol Rosegg. In Chad Beguelin’s “Harbor,” playing at 59E59 Theaters in a Primary Stages production through September 8, love and kinship are complicated matters. Family has a bittersweet taste, as complex as bergamon, or one of the sharper mints. It is something of which we should be wary. There truly may not be a sacred bond holding one generation to the next, or even between siblings. Donna Adams (Erin Cummings) lives in a van with her fifteen-year old daughter Lottie (Alexis Molnar). Donna’s brother, Kevin Adams-Weller lives in a glorious house in Sag Harbor with his husband, Ted (Paul Anthony Stewart). Donna, a one-woman wrecking crew, descends on the two men for what turns into a prolonged, life-altering stay. Lottie, who is “Asian-smart” as her mother puts it, is appalled but also enthralled by the sudden stability of her surroundings. 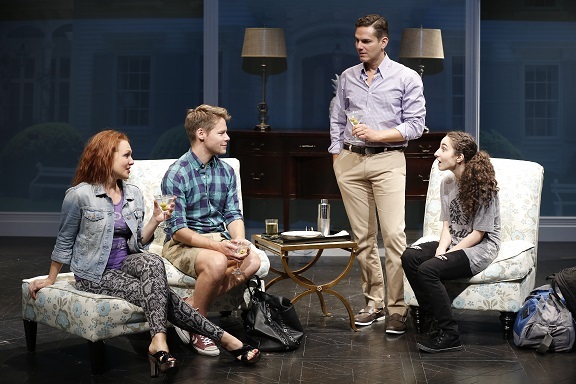 Erin Cummings as Donna, Randy Harrison as Kevin, Paul Anthony Stewart as Ted and Alexis Molnar as Lottie in a scene from Chad Beguelin’s “Harbor” at Primary Stages at 59E59 Theaters. Photo by Carol Rosegg. Many “a brick of truth,” Donna’s favorite expression, gets dropped in “Harbor,” and somehow, it seems like the “brick” to which she refers may not be a building material. If we think that comedy is meant to be funny, “Harbor” enlightens us. “Harbor” is that and poignant and bright and brittle. The cast of four all give commendably brilliant performances under the guidance of director Mark Lamos. Erin Cummings is chilling as the conniving and hapless Donna. Alexis Molnar matches her stroke for stroke as the savvy and befuddled Lottie. Paul Anthony Stewart, who gets a wonderful rant in the opening scenes, recognizes all the subtle nuances that make ted tick, even the things the man doesn’t seem to know about himself. Boyish and unmoored, Randy Harrison depicts a Kevin who is malleable and unformed to a tee. Ted and Kevin’s beautiful and immaculate Sag Harbor house is lovingly designed by Andrew Jackness, with views of its outside projected on the side walls. “Harbor” is as complex and complicated as the most intricate family ties which it portrays with elegance and grace. For more information about “Harbor,” please visit www.primarystages.org.